Confederacy, Camp Sorghum, Columbia S.C., Prisoner cover endorsed "Ben. 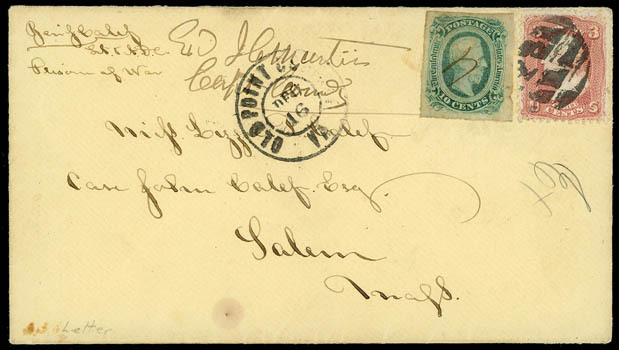 S. Calef, Prisoner of War" to Salem, Mass., franked with manuscript canceled 1863, 10¢ blue and U.S. 1861, 3¢ rose just tied by segmented cork handstamp, matching "Old Point Comfort, Va., Dec 16" cds, manuscript censor "Exd. J.C. Martin, Capt. Comdg." marking (J.C. Martin, Commander of Guard Force), with original one page enclosure datelined "C.S.M. (Camp Sorghum Molasses) Prison, Columbia S.C., November 18th, 1864" to his sister regarding his well being and release, Very Fine and choice. Scott No. 12+U.S. 65 Estimate $1,000 - 1,500. AN EXCEPTIONAL AND RARE PRISONER OF WAR COVER FROM CAMP SORGHUM. Confederacy, Camp Sorghum, Columbia S.C., Prisoner cover endorsed "Ben. 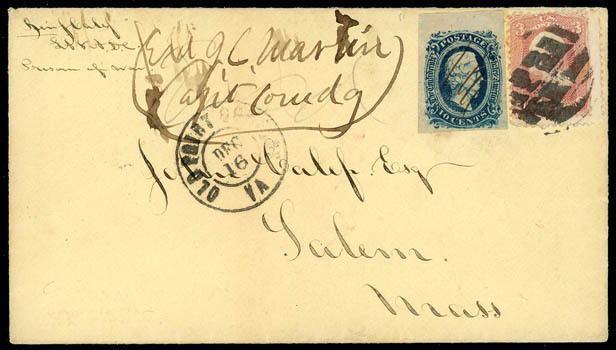 S. Calef, Prisoner of War" to Salem, Mass., franked with manuscript canceled 1863, 10¢ blue, top margin single and U.S. 1861, 3¢ rose just tied by segmented cork handstamp, matching "Old Point Comfort, Va., Dec 16" cds, manuscript censor "Exd. J.C. Martin, Capt. Comdg." marking (J.C. Martin, Commander of Guard Force), with original one page enclosure datelined "C.S.M. (Camp Sorghum Molasses) Prison, Columbia S.C., November 18th, 1864" to his parents regarding the recent care package and his release, Very Fine and choice, with only twenty covers recorded in Harrison. Confederacy, Florence Stockade, Florence, S.C., cover with enclosure datelined "Camp near Florence, S.C., Feb 12th, 1865" with interesting content regarding the inspection tour and demise of Brigadier General John H. Winder…I am still here but do not expect to remain much longer as we are looking for the prisoners to be moved at anytime. There was an order for them to be moved a week ago and General Winder come here to superintend their removal but he dropped dead a few minutes after he got off the cars at Florence which stopped the moving of them at the time. We have not troops enough here to guard the stockade and the trains too while moving and we are now awaiting the arrival of more troops., mentions other troop activities, General Sherman and Beauregard, etc. 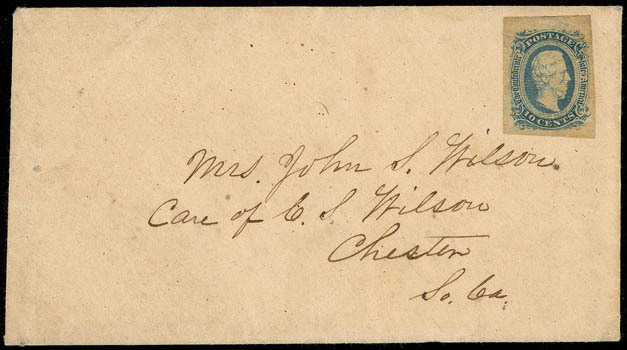 ; cover addressed to Chester, S.C. and franked with uncanceled 1863, 10¢ blue, Very Fine. 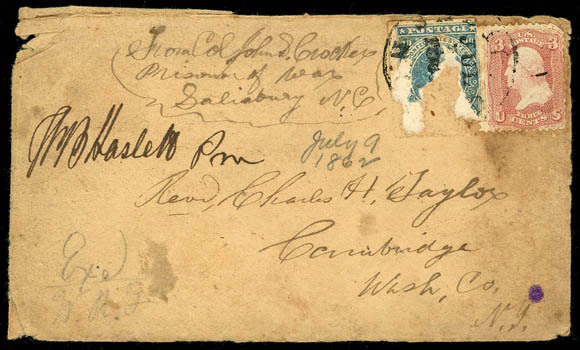 Confederacy, Salisbury Prison, Salisbury N.C., Prisoner cover endorsed "From Col. John S. Cocker, Prisoner of War, Salisbury, N.C." to Cambridge, N.Y., franked with 1861, 10¢ blue and U.S. 1861, 3¢ rose tied by "Salisbury, N.C., Jul 1862" cds, pencil "Ex W.R.F." examiner's marking and signed "W.B. Haslett PM" (Postmaster Army of the Potomac), with original three page enclosure datelined "Garrison at Salisbury, N.C., July 9, 1862" to friend that mentions in part…At the time of our capture, Major Cassidy & myself were performing a dangerous raid what I believe an imperative duty conscious of having fearlessly performed…There are confined here about 200 officers & several hundred privates & political prisoners who bear their imprisonment with noble fortitude; Confederate stamp mostly torn away after crossing the lines and some cover wear, F.-V.F., still a rare combination usage and interesting letter from Salisbury Prison. Scott No. 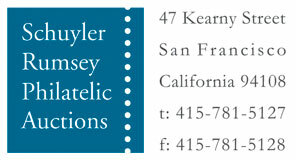 2+U.S. 65 Estimate $500 - 750. 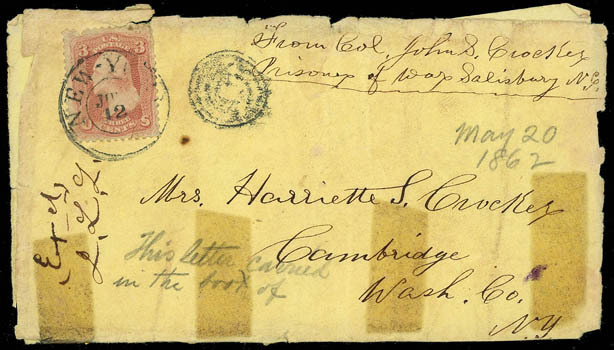 Confederacy, Salisbury Prison, Salisbury N.C., Prisoner cover endorsed "From Col. John S. Cocker, Prisoner of War, Salisbury, N.C." to Cambridge, N.Y., franked with U.S. 1861, 3¢ rose tied by "New - York, Jun 12" cds and duplex target, manuscript "Exd., J.L.L." examiner's marking at left of Chief Clerk of Prison Lt. J.L. Lyerly, with lengthy four page enclosure datelined "Depot of Union Prisoners of War, Salisbury, North Carolina, May 20, 1862" to his wife and mentions the unusual carriage of this letter from the prison…A released soldier has agreed to carry it for me in the lining of his boots. ; cover and letter wear and soiling including separation at sides and tape stains, Fine, a rare usage from Salisbury Prison carried though the lines by an exchanged prisoner. Scott No. U.S. 65 Estimate $400 - 600. 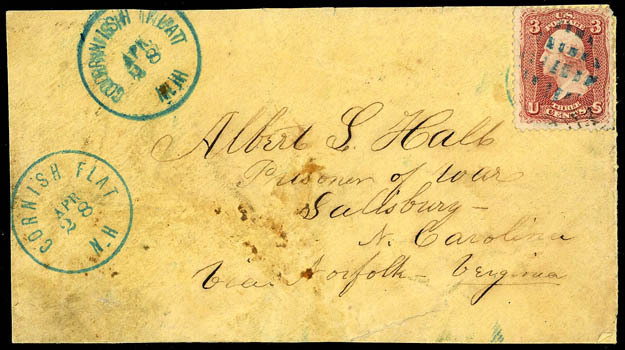 Confederacy, Salisbury Prison, Salisbury N.C., double strike of blue "Cornish Flat, N.H. April 28" cds on 1862 cover with stamp replaced at upper right, addressed to "Albert S. Hall, Prisoner of War, Salisbury, N. Carolina, via Norfolk, Virginia"; top back flap missing and slight soiling, Fine appearance, mainly because of the relatively smaller prison populations, early mail from the September 1861 to May 1862 routed via Norfolk is rarer than POW mail after 1862, Hall was paroled shortly after this envelope was posted. Private Albert L. Hall was a 21 year-old Cornish NH resident when he enlisted 5-21-1861 in Co. I, NH 2nd Infantry. He was taken prisoner at Bull Run (1st Manassas). Military records show him confined at Richmond and then sent to New Orleans, La. Confederate government bought land for the prison on November 2, 1861 and the first prisoners arrived December 9, 1861. Records show Hall as released 5-24-62 (place not stated).